What composers does the pairing of two 20th century violin sonatas call to mind? Bartok and Shostakovich? Prokofiev and Copland? No, here it’s works by two Italians, Respighi and Pizzetti, both shaped by, and deeply committed to, the vast tonal and modal heritage of preceding eras. Oliveira mentions that he made the acquaintance of both these pieces through recordings: Respighi’s sonata in a performance by Heifetz (reissued on CD as RCA Gold Seal 7871-2-RG) and Pizzetti’s in one by Yehudi and Hepzibah Menuhin (now available on Biddulph LAB 067). Perlman was one of the first violinists to speak about getting to know works this way (he referred to Milstein’s recording of the Goldmark Concerto as his inspiration for taking up the piece himself) instead, as might once have been expected, of through live performances by visiting artists in great musical centers, through master classes, or even through a personal relationship with the composer. Respighi was one of the last composers who had studied the violin and played it, at least for a time, professionally. In his works for violin therefore, as in those of an earlier time when most composers came from the ranks of string players, he spoke in his native tongue. The resulting sonata fuses the harmonic language of the preceding century with idiomatic instrumental technique and expression (in a more highly nuanced synthesis than that of his much earlier, much less well known Sonata in D Minor, performed with an exuberant and appropriate straightforwardness by Roberto Baraldi and Massimo Palumbo on Nuova Era 7159). Oliveira brings an impeccable violinistic craftsmanship to the Sonata, which richly rewards a thoroughly violinistic approach. His clean articulation, biting double-stops, keen intonation, and perfectly judged and suavely elegant portamentos, as well as the warm and rich tone of his 1726 “Lady Streeton” Guarneri del Gesu, make for a performance in which violinistic values are paramount. David K. Nelson (Fanfare 19:1) has expressed his Heifetz, all the others seem tame, including the smooth and relatively impersonal Marco Fornaciari and Daniele Roi on Fone 88 F 02-22, and even the superrefined and preternaturally pure (in the last movement, at least) Kyung-Wha Chung (Deutsche Grammophone 427 617-2, 13:6). Lydia Mordkovitch hardly pales beside any violinist, and her ardent, big-boned, and highly cogent reading with Clifford Benson (Chandos CHAN 9351, reviewed by David K. Nelson in 19:1) provides a sort of counterpoise to Heifetz’s leaner, tauter version. Oliveira brings the same soaring lyricism and fine violinistic craftsmanship to Pizzett’s Sonata which, like Respighi’s, speaks a vernacular developed by generations of Italian composers for strings and voice. Despite its vocal character, however, and its high vaulting, and despite the exuberant opening of its finale and the rustic romp at its conclusion, it leaves an overall bleak impression, emanating principally from the slow movement, of which Oliveira and Koenig give a haunting account. Similarly haunting, but not so distinguished by such striking technical command, Leila Rasonyi and Alpaslan Ertungealp (Marco Polo 8.223812 19:4), interpret the first movement’s Phrygian modality as more Eastern than Gregorian. Since, however, the Sonata was composed contemporaneously with Pizzetti’s Old Testament opera, Debora et Jaele, and since Ernest Bloch’s influence putatively pervaded both works, that approach offers many revelatory possibilities, which, however, Rasonyi and Ertungealp seem unable to realize fully either tonally or emotionally. Artek AR-0001-2 (distr. DI Music) 54:38 mins. These are two Italian romantic sonatas of post-Great war vintage. They bear not a trace of dessication or jazz influence. They will appeal to those who love their John Ireland sonatas or indeed the Franck though that is of course is a much earlier era. Resighi's sonata is floridly decorative and Oliveira shoots the passionate rapids with consummate style. You may well know the Concerto Gregoriano. The sonata does not have the sweet simplicity of that work. it is a romantic cauldron the turmoil of whose first movement is offset by a very strong introspective andante followed by a strenuous passacaglia which is given to dreamy rhapsodising (4.49 track 3) the pizzetti is another work of high romance seemingly touched with some Hungarian accents but easily accessible. Oliveira, the singer, clearly knows how to pitch and toss the line in this amalgam of Waltonian ferment and stuttering dance. The Preghiera is a heartfelt invocation speaking of those fallen in the Great War. It is contemporaneous with herbert howells' chamber works to which it is a distant but obvious cousin. It avoids the asperities of the Frank Bridge piano sonata (another Great War generated work). The final vivo e fresco hums and bounces with dance rhythms. There is a high calorific value to Oliveira and Koenig's advocacy and this is accentuated by a warmly veuiled pianosound. There are decent (English only) liner notes. Shortish playing time offset by engaged performances and good repertoire choice. 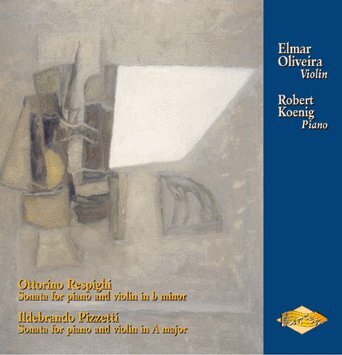 In the liner notes to this satisfying disc Elmar Oliveira mentions that two recordings inspired his interest in the sonatas of Respighi and Pizzetti -- those, respectively, by Heifitz and Menuhin. It reflects something of the house style of Artek, who encourage their artists to link performance with recollection of past recordings and musicians. It's true though that these two violinists were very closely associated with the sonatas -- after Menuhin in 1938 no one returned to the Pizzetti until Rasonyi and Ertungealp on Marco Polo in 1994. Oliveira and Koenig mark the third recording. The Respighi has been taken up on occasion by many great musicians but great recordings are fewer on the ground -- I have soft spots, apart from Heifitz, for Josef Suk (who recorded it twice, firstly with Pananka in 1953 and then with Hala in 1980) and a trio of Americans -- Rosand, Shumsky and Kaufman. In the Wartime Respighi -- the Pizzetti was written two years later -- a contemporary of Ireland's A minor sonata, we feel the turbulent and kinetic drama of a violinist-composer writing in media res. The obsessive and occasionally violent aggression of the contours of the violin line encourage great depth of tone form Oliveira (he digs deep into the G string) and he maintains a consistently virile and inflected series of shapings. His soaring lyricism is projected and maintained with considerable distinction and his playing in the higher positions is, with his double-stopping, commendable. Curiously I was reminded in passing moments of Elgar's almost contemporaneous Sonata. The slow movement opens with the piano's delicate tracery, the violin soaring aloft with effortless ascent and becoming subsequently obsessive and unsettles and agitated. Oliveria conveys a communing depth and dignity as the movement continues, Robert Koenig's rapport an indissoluble component in the movement's success, the burgeoning not untroubled lyricism affecting. The Passacaglia finale undoes all that. Stern and remoseless passagework takes the work in an altogether different direction before Respighi introduces and develops some quirky little rhythmic games between violin and piano, some lyrical and some effusive. The work ends in a spirit of stoical decisiveness, well converyed by Oliveira and Koenig. Written at the end of the First War the Pizzetti opens pensively with the violin above a hypnotic, haunting and repititious piano line. A deeply expressive second subject emerges which manages to sustain poetic and lyric intensity at a relatively slow tempo. Indeed the ability of both men successfully to guage the elasticity of the line here is excellent. The meditatively vocal quality of the beautiful Preghiera second movement is given added plangency by the little unsettled intensities of the piano left hand. Oliveira plays this movement with a veiled, smoky tone. Contrasted with the interior intensity of thie movement's prayer for the dead is the finale's fluttering and dancing vivacity (marked Vivo e Fresco), which is broadly consolingly optimistic, though it still finds time for some occasional hints of loss in its fabric of dance-like exultation. This is a splendid survey of Italian Great War sonatas. It gives renewed life to the Pizzetti, a work that deserves far more than an occasional hearing, and joins fine company in the Respighi. Fine production values here from Artek, despite the relatively poor playing time, and a strong recommendation for the performances.